Paula ChampagneA scavenger hunt is one of the outdoor activities kids can do anywhere, including Boston’s Arnold Arboretum. Getting the kids outdoors might be as easy as heading into the backyard or down the block to the neighborhood park. But once you’re outside, keeping kids engaged for an hour or two can be challenging. 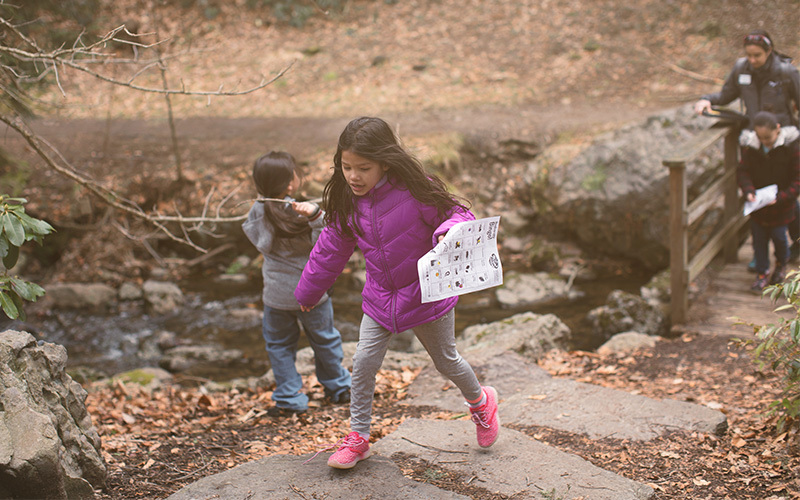 For a list of cheap and simple outdoor activities kids can do anywhere, we turned to Angel Santos Burres, the director of AMC’s Outdoors Rx. Most of these activities call for materials you probably have lying around the house. Can your kids find five different kinds of fallen leaves? Three different kinds of flowers? (Identify them, but don’t pick them—a great chance to talk about Leave No Trace!) Can they find an item that’s a circle, a triangle, or another shape? Pick up a stack of paint swatches from the home improvement store and have the kids find natural items in those colors. Make cardboard picture frames then ask kids collect items they like to put inside, creating pieces of art. Talk about why everyone chose the items they did. Magnifying glasses are inexpensive and a lot of fun! Take a microhike. Create a circular habitat somewhere in the yard using a hula hoop or a piece of string. Have everyone surround the micro-ecosystem and point out everything they find. If you don’t have lots of grass, imagine out loud what the world would be like if you were an ant, a grasshopper, or a worm in this minizone. Using watercolors or any kind of paint and scrap paper, pick out something in the backyard and paint it. Make a journal from a single piece of paper to record nature drawings and writing. In their journals or elsewhere, have your kids observe and record the weather for a week. Follow the seasons: Every three months or so, take your kids outside and observe how things have changed since prior season. Venturing out at the same time every hour, observe how the light and shadows change throughout the day. Look for evidence of the power of nature (“Nature always wins!”), spotting flowers growing up through cracks in the sidewalk and ivy climbing fences. Set up a tent and camp out in the backyard! Venture out in the rain and observe how water flows in your yard or park. Look for tracks in freshly fallen snow. What animal made this? Did it have four legs? Two legs? Why did it come into this part of the yard or park? Make your own scavenger hunt. Sit down with your family and list things you think you will find then go out and try to find them! Plant Picassos: Use a clothespin to clip together bundles of nature (fallen leaves, flowers, needles) to use as paintbrushes. Use cookie cutters to make snow cookies of different shapes. After a snowfall, hide a white sheet somewhere in the yard and ask the kids to find it. Use it to talk about how plants and animals camouflage themselves. Have kids cup their hands behind their ears, mimicking a deer’s big ears, to improve hearing. Ask children to extend their arms and hold up two fingers in front of their faces, moving their arms apart to notice how far to each side their peripheral vision extends—like an owl. Have children wet their nostrils with their (clean!) fingers then sniff the grass, trees, and moss like a dog to see what they can smell; finally, have children step quietly and slowly like a fox, heel-to-toe, to try to approach a bird. If you have children who are reluctant to go outside, have them take whatever they’re doing—a book, a game, or even a tablet—out into the yard. Well, what are you waiting for? Get the kids and GO! Design a backyard oasis that helps build a love of nature in children. Score tips on raising free-range offspring. Find out how to nurture pint-sized eco-advocates. Get answers to kids’ frequently asked outdoor questions. Steve Holt is the associate editor of AMC Outdoors.